Rebecca De Mornay is at her brilliant best in this riveting drama available for the first time on Blu-ray, featuring new digital restoration with enhanced picture and sound. Claire Bartel has the perfect life and family...exactly what her new live-in housekeeper, Peyton Flanders, desires. How far will Peyton go when the life she wants belongs to someone else? And will it be too late for Claire to stop her? Trust is her weapon. Innocence her opportunity. Revenge is her only desire. 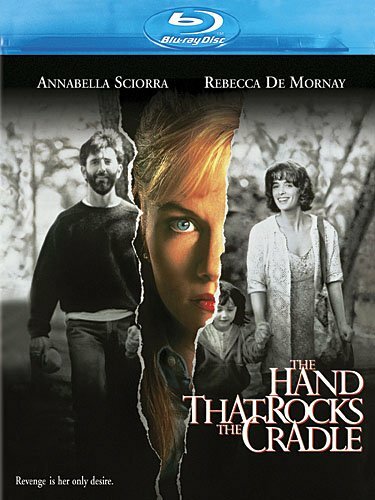 Relive all the chills and excitement of the critically acclaimed thriller Hand That Rocks the Cradle in a sensational 20th Anniversary Edition . Rebecca De Mornay (Risky Business) is at her brilliant best in this riveting drama available for the first time on Blu-ray, featuring new digital restoration with enhanced picture and sound. Claire Bartel has the perfect life and family...exactly what her new live-in housekeeper, Peyton Flanders, desires. How far will Peyton go when the life she wants belongs to someone else? And will it be too late for Claire to stop her? Experience every breathtaking moment like never before on Blu-ray!